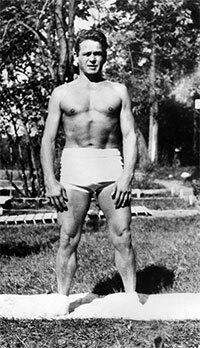 In 1923, German-born Joseph H. Pilates brought his unique method of physical and mental conditioning to the United States. Joseph Pilates had been asthmatic as a child, motivating him to improve his strength and physique. His study of yoga and the martial arts, and his work with physicians and his wife Clara (a nurse), led to the development of his conditioning system. More than 70 years later, his techniques are being enjoyed around the world. Joseph Pilates’ studio in New York City attracted a variety of athletes and fitness enthusiasts, but it was the professional dance community that most strongly embraced and later improved his techniques. Dance legends such as Ruth St. Denis, Ted Shawn, Martha Graham, George Balanchine and Jerome Robbins studied under J. Pilates and taught the concepts to their students. Pilates’ techniques became an integral part of dance conditioning. In the 1960’s, J. Pilates’ students began to open their own conditioning studios. The first generation of instructors combined Pilates’ principles with their own interpretations and knowledge gathered from others. In 1967, the movement took an explosive leap forward when Ron Fletcher moved to Los Angeles. Fletcher, a dancer, possessed deep knowledge of the method and added many of his own important contributions. Fletcher’s presence and influence produced a steady stream of instructors who carried the principles throughout California, Texas, Colorado and, ultimately, the world. Today, the vast majority of instructors can trace their origins to Fletcher’s Los Angeles studio. In New York City and in many international communities, growth of the method can be traced to Carola Trier, Kathy Stanford-Grant, Eve Gentry, Romana Kryzanowska and other original students of Joseph Pilates. In 1984, the Center for Sports Medicine at Saint Francis Memorial Hospital, San Francisco, began to use some of Joseph Pilates’ concepts to rehabilitate and condition dancers and athletes. Physicians and therapists at the hospital created a new system, combining Pilates’ principles with current practices, standards and research in dance and sports medicine. Work at Saint Francis became recognized internationally, bringing it to the attention of mainstream health and fitness communities. Soon other hospitals, universities, and physical therapists started their own programs.